Everybody’s heard of Uber — the service that matches drivers and passengers, but I don’t know anyone over 40 who’s ever used it to go anywhere. My son and daughter-in-law live in a college town, use it often and love it. I got the scoop about how to use it from them and decided to take my sister and parents on an Uber field trip when I visited them this past weekend, so we could all check it out. I loaded the Uber app on my smart phone a few hours before our adventure. Thought it was going to be a snap, but got hung up when it directed me to scan my credit card. A big green box appeared on the screen but I had no idea whatsoever how to scan my card (from the front? from the back? do you have to click something?) — since I just got my first smart phone about a year ago. Googled for help and found out it’s done from the back of the phone like you’re taking a picture of something, but it still wouldn’t work. Called my son (waking him up, unfortunately) for help. He said they’d entered their numbers manually. After some discussion, we decided to go to a restaurant for lunch. I pressed the button to call for a driver. The block at the top of the GPS screen displayed various street number addresses around my parents’ condo — changing periodically, so I filled in the correct house number and street. We put on our shoes, grabbed our purses and went outside. A photo of our driver and the make and model of her vehicle appeared on the screen, as well as a map of her location and an indicator how many minutes it would be before she arrived. In less than four minutes, the car appeared. There was no sign on her vehicle or any indicator that she was an Uber driver, so I opened a door and saw that the face matched the app, and we got in. I warned her it was our first ride, and that we’d have a lot of questions! She’d only been driving for three weeks, after losing her full-time job, and didn’t know many of the answers, but she was some help. Less than ten minutes later, our driver dropped us off at the restaurant door. The fare was billed to the credit card, so no paperwork was necessary. It was quick and easy! After lunch, we were ready to return home. That part wasn’t as easy. A GPS screen and an address appeared on the app and, since I was in a strange town and didn’t know where we were, I assumed the GPS address was correct. (Should’ve checked with my dad.) So I pressed the button to call for a driver. After ten minutes passed and no car appeared, I checked the phone and found a missed call. Called back and it was the driver. He said he was in a residential area and asked if that’s where we were. I told him no, we were at Panera Bread next to Lowes. So in ten more minutes, he appeared (after a second phone call). His vehicle, too, had no identifying markings and I had to open the passenger door and take a look to see if his face matched the driver on the app. The app gave only the make and model of vehicle, and since I know nothing about various types of cars — that wasn’t a bit of help. I felt bad that the driver had been riding around in the wrong place for a while –and that my family members were cooling their heels in front of the restaurant the whole time — while I learned that the GPS is not always correct! On the ride to the restaurant, I accepted the vehicle assigned — and texted the driver before she arrived to say there were four people, in case that was a problem, but she answered and said it was OK.
She later told us that you can request a larger than standard sedan by pushing the slider on the bottom of the app from Uber to UberXL (extra large vehicle). So for the ride home, we requested a larger vehicle — to see what we got, and to compare the price difference. The ride home — once the driver found us — was also quick and easy. I got two emails afterwards that stated the fare for each: it cost $8.97 to drive four people 3.5 miles to the restaurant in a standard vehicle and $14.53 to drive four people the same distance in an extra-large SUV with two rows of passenger seats. Not bad! Regarding tipping: my son said the app states very clearly that no tipping is required, but there is some controversy about that among his friends. So do whatever you feel is right. Also, be aware that Uber has a “surge rate” for peak periods — which is a multiple of the normal fare. For example, on the night of a special event in town, the rate might be 5x — or five times — the normal fare. The Uber app does display that information and asks you to click and agree to it, so it shouldn’t be a surprise. But if you’re going to use the service on New Years Eve, sock away some money beforehand to arrive home safe and sound. I can see that Uber could be extremely convenient when you need a ride home from the eye doctor who dilates your eyes, a ride from the garage during car repairs, or anytime you want to have a few drinks. And I plan to use it again! Let an Uber driver take you for a ride and let me know how it goes. Use my invite code, dianeo600ue, and get a free ride up to $15. Redeem it at https://www.uber.com/invite/dianeo600ue. 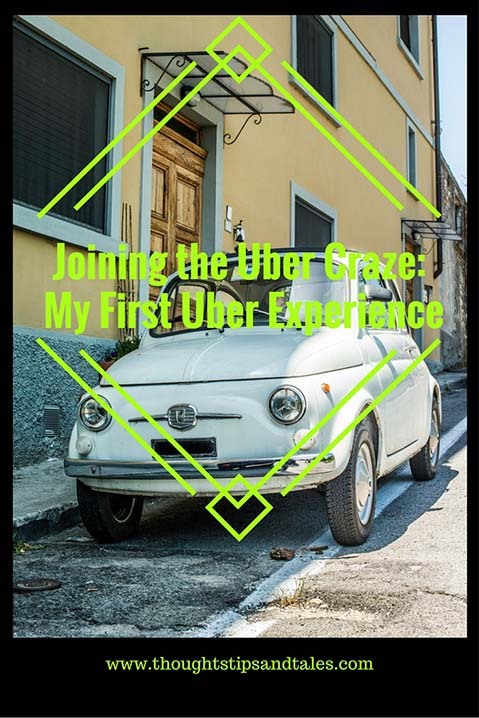 This entry was posted in How to, life, miscellaneous, uber and tagged first uber ride, tips for first uber ride, uber, uber adventure, uber cab, uber experience, uber passsenger, uber rider. Bookmark the permalink.